A familiar brand in Japan, Epoch makes its North American debut with the fully-licensed 2015 Epoch International Premier Tennis League. Each hobby box includes a full base set along with one autograph and one match-worn relic card. For those unfamiliar with the Coca-Cola International Premier Tennis League or IPTL, it is an Asian-based league that is similar to the World Team Tennis league in the United States. Basically, it is a team-based competition composed of worldwide players that are selected via a draft. Each team has several head-to-head matchups spread out over a few weeks in December. Even if you don't know the league, chances are good you have heard of the many stars that are participating. 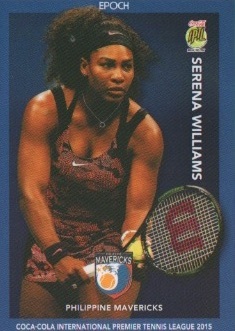 Covering all players in the 2015 IPTL, the 38-card base set includes options like Serena Williams, Maria Sharapova, Rafael Nadal, Roger Federer and Andy Murray. While there are two formats, both options include the full base set. Exclusive to retail, there are also numbered parallels that feature stamped facsimile signatures. This includes Gold Foil, Silver Foil, Ruby Foil and 1-of-1 Foil. 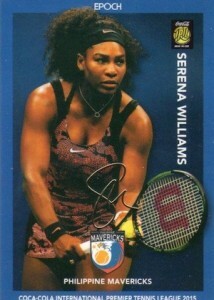 As the main draw for collectors, all the hits are serial numbered. Showcasing mainly hard-signed signatures, autographs come in several different designs and are led by the base Signatures set with 30+ subjects. 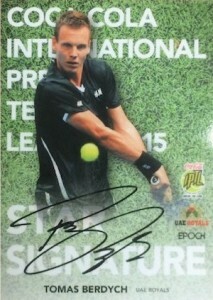 Other themes include Tennis Ball Signatures, Star Signatures and Young Star Signatures. 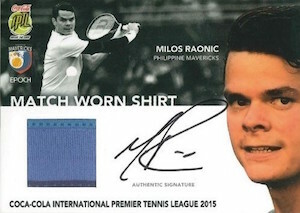 Featuring shirts worn in the 2015 competition, there are both vertical and horizontal relics for the Match-Worn Shirt cards and a total of 12 subjects. Most of the players can also be found with a Signed Match-Worn Shirt card. A detailed image of all the match-worn shirts used in the release can be seen in the gallery below. The 2015 tournament was won by the OUE Singapore Slammers as the they prevailed over the Indian Aces in the finals held on December 20. Click the expand icon (four arrows) in the right corner of the image for larger quality image. Good: Mostly on-card autographs, some big signers, all hits are numbered to #/80 or less, licensed. Bad: A few sticker signatures, main design is a little generic. The Bottom Line: If you collect tennis cards, this is definitely a product to consider despite being for a more obscure tournament. The box price is perhaps a little on the high side but with two guaranteed hits and a checklist filled with some of the key modern names in the sport, 2015 Epoch IPTL is an appealing tennis product. As the first time I have ever handled Epoch cards, I did not exactly know what to expect. I had not previously heard of the tournament but I am familiar with the concept as I have attended a few WTT matches. Seeing the same style of cards on a regular basis definitely made the Epoch base cards stand out for me. Because many of the base player photos feature tight crops, the simple design feels a little cluttered with the addition of several logos. Adding to that, the teams in the base checklist are distinguished by a colored border of varying color (red, blue, green, etc…) To me, this is too much dark color and not enough contrast. While the main autograph set relies on the base design and most feature a large on-card signature, the other signed sets offer a little more brightness in their design. I particularly like the Tennis Ball Signatures which — spoiler alert — feature a tennis ball in the forefront of the design as the actual signing area. Anyone that has ever seen a real signed tennis ball knows they never end up looking great and this design takes away the logistical issues but still directly relates to the sport. I honestly think this should have been the main autograph design. 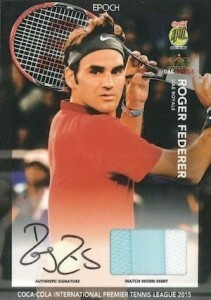 The only other cards in the set are part of the match-worn shirt inserts. Available in both horizontal and vertical designs and limited signed versions, one negative is the signing area for the vertical Autographed Match-Worn Shirt. A big draw of on-card signatures is the lack of a very confined signing area like you would find with a sticker. Because the signature area was placed right next to the relic spot in the vertical design, it left very little room for either. The checklist is one of the key strengths for 2015 Epoch International Premier Tennis League. Modern tennis still struggles to get consistent coverage in the hobby and this release is stacked with some of the top current names. Looking further into the checklist, while all cards feature low print runs (all autographs #/30 or less, all relics #/80 or less), most of the key players ( including Nadal, Sharapova, Murray, Federer) are no more limited than the other names in the checklist. Because they are not short printed, the overall odds are more favorable to the collector to pull a big name. However, several players are essentially doubled up as they are included a second time in the other autograph insert sets. Box prices for 2015 Epoch IPTL sit around the $95-100 mark and then you have to account for the niche nature of a exhibition-specific release in a relatively limited area of collecting. For two hits, that might be a little high for some collectors, but given what options are possible and the fact that they showcase on-card autographs and very limited print runs, the product certainly makes a solid case for value. I get that it would likely be cost prohibitive or even impossible based on licensing, but it would be amazing to have a product like this for one of the Grand Slam tournaments. 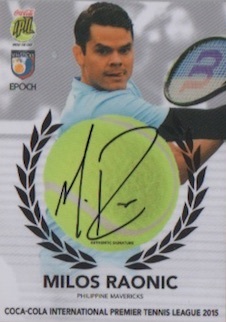 I hit a huge card in the box I opened (Roger Federer) and actually lucked out even more by pulling a signed card for Milos Raonic (top 15 in current ATP rankings). That is not enough to sway my thoughts on the product as a whole, but it certainly made the break more fun. Because it is a box set, it is not really a traditional experience since the cards are all in a group with a cellophane wrapper holding the cards together. For me, opening packs is one of the fun parts of the process. As a factory set, it is unfair to penalize it for that reason, but, in my opinion, the format is just not geared to the same enjoyment as a traditional product. Nevertheless, I thought this was a great debut for Epoch in the international tennis market and hope they continue to produce sets with North American distribution. The box used for this review was provided by Epoch. 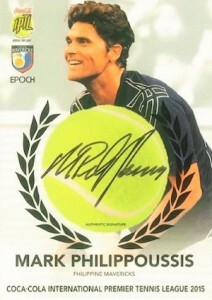 MARK PHILIPOUSSIS 2015 EPOCH IPTL TENNIS AUTO SSP 27 BGS 9.5 AUSTRALIA RARE!